Ode to Joy! Peggle is on the iPhone. Developed by PopCap, the challenging and award-winning puzzle game has gained a reputation for its iconic classical soundtrack, beautiful-thematic backgrounds and alliteratively-named animals. When initially launched for other platforms a couple years ago, this colorful and clever game garnered national press and major gaming awards. Released for the App Store in May, the game is as fresh and fun as ever. At first glance, the game appears to be a pretty straightforward combination of pinball and Snood. But Peggle is far more than that. While the object is simple—clear the stage of orange pegs—the methods require clever strategies, knowledge of geometry, and some lucky bounces. All It’s Pegged Up to Be: Make the orange-colored pegs disappear to win the level in Peggle. 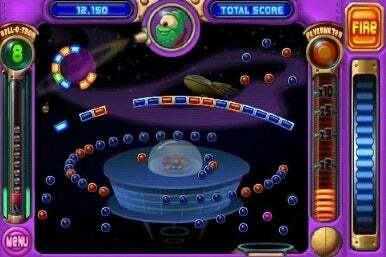 The game is played by launching a pinball at the screen below using a cannon that is fixed in place. You rotate the cannon and fire the ball using the touchscreen; the ball will clear any block or peg that it bounces against, so knowledge of physics and geometry is helpful. But as the game advances, there are caveats to such a straightforward goal. Special green pegs unlock potent powers, purple pegs increase your score, ball catchers can award you additional balls to use, and obstacles constantly stand in your way. You start with only 10 balls to clear a given stage but additional balls are awarded by either having the ball land in a constantly moving ball catcher at the bottom of the screen or by scoring a huge number of points with a single move. Superpowers can alter the trajectory, impact, and abilities of the ball as well. The game is broken up into more than 10 levels with at least three stages per level. Each level is overseen by a thematic creature with a unique power to teach you and new challenges for you to confront. Bjorn the Unicorn is the iconic guide of the first level and the game’s unofficial mascot. Each level’s creature has thematic elements in his/her stage including space exploration, ancient Egypt, nature, and mysticism. Though the game was originally launched on other platforms, the controls are perfectly suited for the iPhone. You can either utilize the touch wheel on the side to adjust the launcher’s angle or you can touch the screen itself to direct where the ball should be launched. By double tapping you can zoom see a closer shot. On certain levels you’ll be able to deploy bumpers that can be tapped to manipulate, but since they’re positioned so close to the menu screen they’re a bit difficult to utilize smoothly. For those who want a deeper experience, in addition to the long adventure mode (which should take you several hours to complete), there's a duel mode that will allow the player to battle against either the computer or a second player (on the same iPhone) by taking alternative shots. The highest score wins. Sadly, network multiplayer is not supported at this time. However, there is plenty of content for a single player to enjoy: There is a collection of “master” challenges that include multi-level challenges, duels against tough computer AIs, and “insane” challenges that require the player to clear a board with only limited balls. It’s remarkable for how easy it is to pop in and out of the game (Peggle automatically saves your move so when you return you’ll pick up where you left off). Peggle is an instant classic and easily one of the most addictive puzzle games to come out in the last decade. Appealing both to casual and seasoned gamers, the nuanced, funny, and deep app is a must-download for all iPhone gamers. Peggle is compatible with any iPhone or iPod touch running the iPhone 2.1 software update.